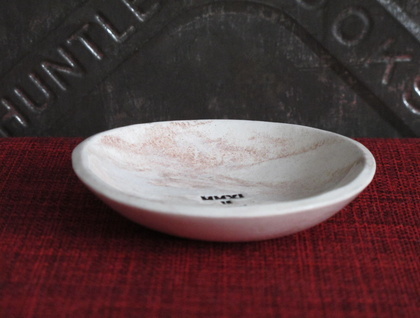 The Emerge range has been made in commemoration of the earthquakes that struck Christchurch from September 2010 to June 2011 and the damage that they caused. Like many, this silt also affected my property and I decided to so something positive with this substance that has caused so much damage and so much loss. My main motivations with the Emerge range are to create beauty from disaster, and to help the present and future of our city. When you make a purchase, please add a note in the 'message to seller’ regarding a current charity helping Christchurch' - helping the future of Christchurch with the rebuild or helping families in need now. Each dish is different and will not be the one pictured due to nature of marbling the silt in by hand. Some will have a heavier pattern, some will be lighter in colour - but they will all contain silt. 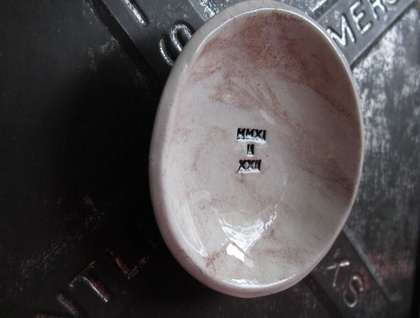 The MMXI-II-XXII dish measures approx 9cm wide x 2cm deep. 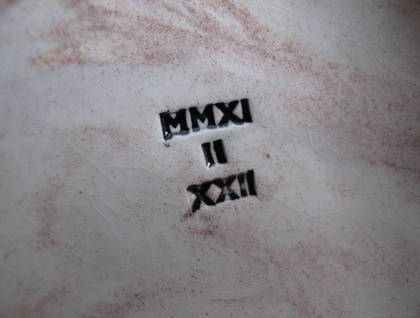 I have hand stamped the Roman Numeral date 2011-2-22. 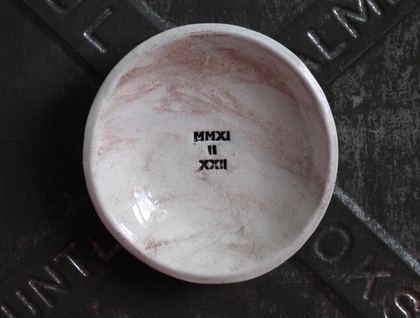 I have underglazed it in black and used a clear crackle glaze over the design. Thank you for your support in helping to rebuild and reshape the future of Christchurch. Remember to choose your charity.